EXECUTIVE SUMMARY: The most important question arising from the events in Amona is not who won and who lost, but where we are heading. The State of Israel is approaching the crossroads of a crucial decision regarding its policy on the future of Judea, Samaria, and Jerusalem. The outcome of the struggle for Amona is now clear: the families have been evicted from their homes and the settlement demolished. Once the police forces were dispatched, there was no doubt about their completing their mission. The question was not what would ultimately take place on the hill, but how the struggle would be managed. From the moment that struggle commenced, everyone was focused on the day after. The aim of the settlers and their supporters was clear. The object of their (mostly passive) physical struggle was not to prevent evacuation; that stood no chance. They fought for the moral duty of the Jew, who believes in and hopes for redemption, not to be coerced into abandoning his home on ancestral land without a struggle. Their goal was to establish awareness, both in Israel and abroad, that the Jews are here to stay, even at the cost of struggle and sacrifice. Thus, the key question arising from these events is not who won and who lost, but where we are heading. Israel is approaching the crossroads of a crucial decision on the shaping of its policy regarding the future of Judea, Samaria and Jerusalem. In anticipation of this decision, the settlement enterprise needs more than ever to widen its circles of support and solidarity among Israeli society. This is where efforts must be directed. The events at Amona can be utilized to achieve broad public support. They should be conveyed not as a sectoral issue pertaining solely to a handful of settlers, but a national issue that affects the future of the State of Israel. It is time to persuade the Israeli majority that even for the residents of Gush Dan, the future depends more than ever on our expanding our hold on the West Bank. In this respect, the outcome of the Amona struggle will be determined over the next few months by the extent of public support. No wonder settlement opponents seek to highlight and exploit outbreaks of violence that took place during Amona’s evacuation. They do this to weaken public sympathy for the settlers and their thousands of supporters. I listened well to the cry of pain expressed by the father of a Border Police soldier who was active at the evacuation of Amona. A rift between the settlers and people like this father would be a national disaster. Those who hope to lead the Israelis to a consensus in favor of a broad retreat from the hills of Judea and Samaria will try to take advantage of this potential for alienation. It is common knowledge that the Border Police and the Israeli police force, who deserve much appreciation for fulfilling their duty in many areas of conflict, do not hail from Ofra, Beit El, or Efrat. This inter-sectoral social fracture will be exploited by settlement opponents. They already highlight the difference between “right-wing settlers” and general public supporters of the Likud Party, and have sought for years to distinguish “ideological settlers” from “light-weight-settlers” who are mere housing-upgraders. 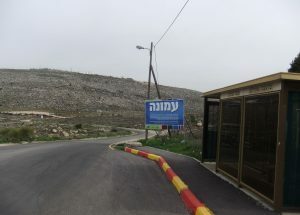 Even within the alleged consensus on including the settlement blocs under Israeli sovereignty – essentially Ma’aleh Adumim and Ariel – there is the potential for alienation. There lies a key to political upheaval. The struggle over Amona can thus be a turning point in the struggle for the future of the Jewish people in its land. With that in mind, we must not only mend rifts, but transform the settlement enterprise from a matter of sectoral interest to religious groups within Zionism into a matter of national interest with broad support. We are speaking, after all, of an area of great potential with many possibilities for people from all over the country, from Ashdod and Bat Yam to Netivot and Tel Aviv. By opening up the area to large-scale settlement, the Israeli government will clarify by its very actions that the era of withdrawal is at an end. For some time now, especially following developments in the Gaza Strip after Israel’s withdrawal from Gush Katif, there has been growing public recognition that should the State of Israel converge onto the narrow coastal strip, it will have no security or economic future. Most of the public yearns for a new course. They will fully support an Israeli government that leads a change in terms of the realization of Israeli interests in Jerusalem and Area C in Judea, Samaria and the Jordan Valley. It is towards this objective that efforts must be geared in the days after Amona. Maj. Gen. (res.) Gershon Hacohen is a senior research associate the Begin-Sadat Center for Strategic Studies. He served in the IDF for 42 years, commanding troops in battle on the Egyptian and Syrian fronts. He was a Corps commander, and commander of the IDF Military Colleges. This is an edited version of an article that appeared in Makor Rishon on February 5, 2017.